I had been eyeing a couple of the new MTH Rio Grande F3s for a while (this one and this one, to be exact). After seeing the real thing again earlier this year at the Colorado Railroad Museum, I figured I really did need them! Unlike some of my previous engines, though, this time I decided to take the (mostly) easy way out and just order the 2-rail version with the fixed pilots. So this was trivial to do while I was swapping in the three rail wheelset. Due to the limited clearance between the truck and the end of the chassis, I designed this mount to use the 743, rather than the 740, to maximize the rotation of the truck. (The 740 actually fits as well, but the wheel flanges hit it, so the truck rotation is reduced.) Just for a change of pace, I used Shapeways new black nylon "professional plastic" material, which they bill as a good material for structural parts. It doesn't have the finish quality of the frosted acrylic, and it's a little more expensive, but it is pretty rugged. The only additional steps required were to tap the holes for the screws and bond it on. Finally, I really like the new cab detail, which hides the motor from view through the windows. But... lime green? really?? lol. Anyway, I took care of that while I had the lids off, and painted the chairs and instrument panels as well. Nobody else will ever notice, but I know it's there. Good job. I don’t know what radii you have on your layout. If is is broad enough you may want to consider shorter shanks on the rear of the units to draw them closer together. Those are really nice and you've done a great job with them. We don't see many comments on the MTH Diesels - E & F units, nor PA's. 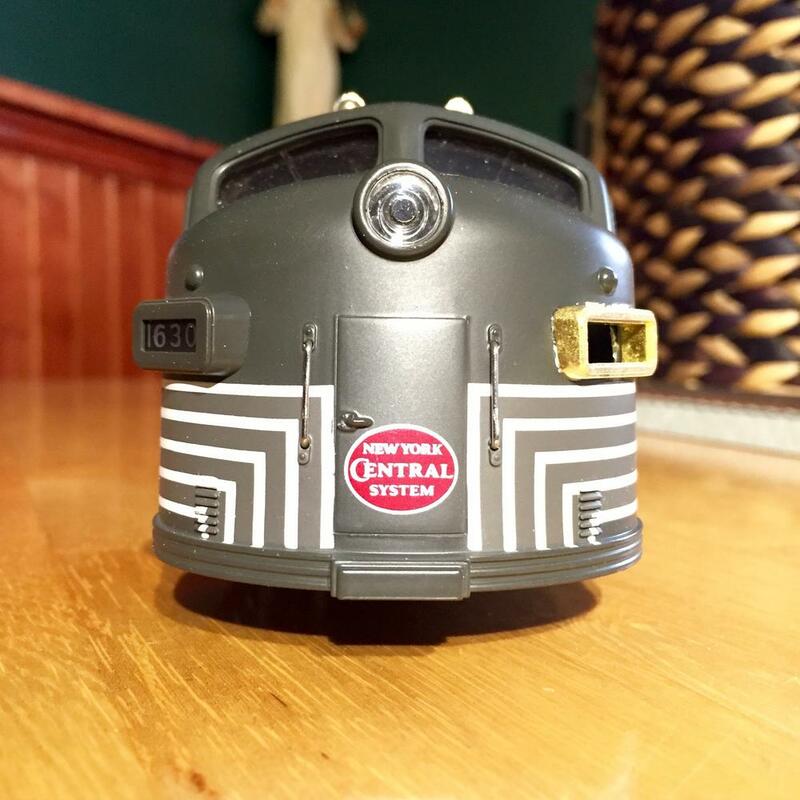 The Lionel models seem to get the most coverage but require the most modification to look better! Long live the Boston & Albany. I don't start rumors, I only verify them. Maine Central 470 to operation. I only use 740's because the 743 shank is wider and limits turning radius through crossover movements, "S" curves (reverse curve), and tighter radius curves. If you run into that just use the 740 and modify the draft gear box. 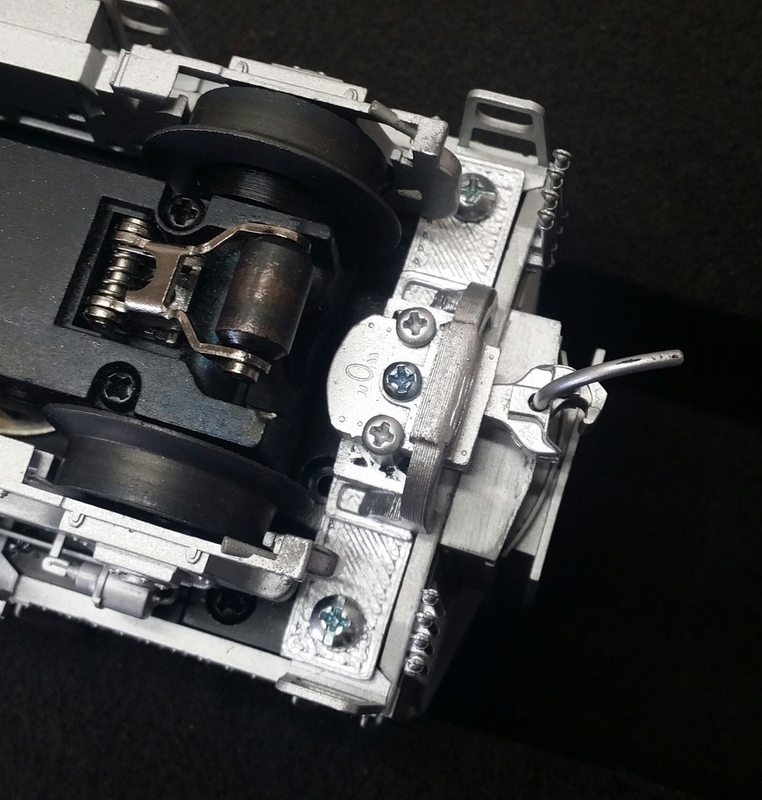 You can also open up the sides of the draft gear box to allow for even more turning radius Just an FYI incase you have derailments due to close coupling. In the first paragraph you say you bought the "2 rail version"; yet these appear to be 3-rail, what with the center pick-up roller and all. If I may answer, the MTH 2 rail diesels are also 3/2 convertible. They come with the 3 rail roller pickups in the box. He just had to purchase the 3 rail wheels, and swap them out.
" on Sour mash and cheap wine " ?? Why go back to DCC when I have DCS! Wow, that's a cool feature. 1. Felt that lime green was inappropriate? ("But... lime green? really?? lol.") EMD thought that lime green was pretty cool and painted all of F unit cabs that I've been in that color and I've been in a few. 2. Replace the "scale wheels" that came with the locomotive? Would your track not accommodate them? Scale wheels sure look better. 3. Did not use the Kadee coupler adapter pockets provided? Being the delighted owner of two brand new MTH CGW F3 As, I was able to use them and they provide good, close coupling plus they'll accommodate sharper curves since they're truck mounted. These questions aside, you've done an elegant job and lack only Laidoffsick's detailed hoses. GENERAL NOTICE - Safety is of the first importance in the discharge of duty. Obedience to the rules is essential to safety. To enter or remain in the service is an assurance of willingness to obey the rules. 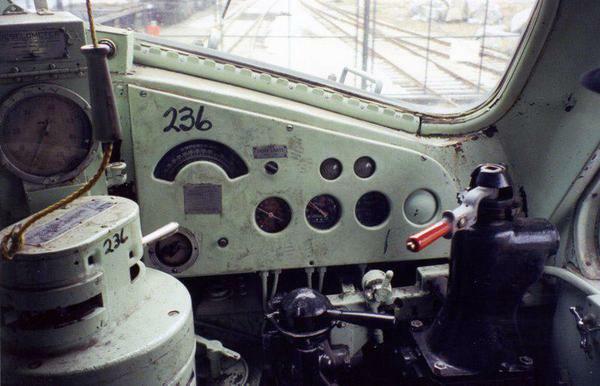 The reason that EMD used two different colors for cab & engine room interiors was; that's what the railroads were using for steam locomotive cab interiors. There were generally two "colors of choice", either Jade Green, or Sued Gray, for steam locomotive cab interiors, which thus carried over to the interior paint on EMC/EMD diesels, ninth mid to late 1930s. Good points. As I mentioned, the 740s will fit, with some increase in minimum radius due to reduced rotation of the truck. If the engines will still go around 063, which is my minimum, I will likely do that. Not familiar with the MU hoses you mention, but I will check them out. I like that the new ones are rubber at least, so they don't go flying in the event of a minor... incident. I guess they just looked really bright to me, not so much like what's in the pics you posted. Well, I did use the provided kadee mounts on the fronts of the units, which worked really well (although these are fixed pilots). There are no such mounts on the rear of the units, however, hence the 3d printed coupler mount. Are you saying your units had kadee mounting provisions on the rear of the units as well? I just used a 2-56 machine screw, nut and washer to bolt a 743 to the casting to which the MTH fixed coupler had been attached. I used the "gear box" for the 743 as a shim, up-side-down, and I was good to go. The fact that the coupler is attached to and swings with the truck is a plus. You can see by the length of the MTH coupler shank that the Kadee 743 mounted where the Phillips head screw attaches to the casting will give an much, much closer coupling. However, as stated earlier, you've done an elegant job of body mounting the 743. I just ordered a MTH Southern Pacific F-3A 3 rail dummy I hope to turn into a 2 rail powered unit. Your Rio Grande F3s look so much better with Kadees. Yes, these are fabulous looking engines to begin with, and they look even better with kadees. The options MTH provides with the 2 and 3 rail versions are really slick. And of course there is the benefit of having real couplers on both ends, so you can make/break consists on the fly, run them singly or paired up, or whatever. You might also be interested in this thread. Mine had a tendency to pop wheelies, probably due to the combination of traction tires and no lobster claws. With that fix in place, they are smooth, solid runners, and already among my favorites. Please post details of your conversion from dummy to powered unit when you get around to it. If I can ever find one, I want to do a powered B unit of the Rio Grandes, so I'd be really interested in how that turns out for you. LMK when you have a 3D printed pilot available for them, I have a NYC set just waiting for them!